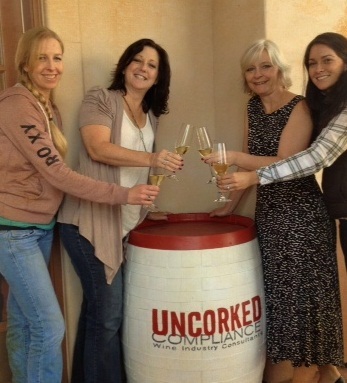 As wine industry compliance consultants, Cyndee Smolik and Nancy Headland of Uncorked Compliance in Paso Robles have over nine years of combined experience assisting their winery clients through the maze of mandated licensing and reporting requirements. Along with their fellow staff members, they provide a one-stop source for a host of alcohol compliance services and hands-on management throughout the process. Grants Processor License for wineries and grape wholesalers. California law provides that no winery can legally buy or contract for grapes unless it has a valid processor’s license. The CDFA is a state agency that protects the growers if they have an issue with a buyer such as non-payment. If the winery has its own vineyard it’s not necessary to have this license. But it’s required if they’re going to buy anybody else’s grapes. Grants liquor licenses for wineries and importers and wholesalers, as well as off-site tasting rooms. The Public Health Security and Bioterrorism Preparedness and Response Act of 2002 states that wineries must register with the FDA to protect against bioterrorism threats. If there’s ever a bioterrorist attack involving tainted wine, they need to be able to find the person who made it and everything that went into that bottle.